Yahoo Sports' Terez Paylor and Charles Robinson report on the latest news stemming from two stories coming out of Kansas City. First, Terez provides an update on wide receiver Tyreek Hill being involved in multiple police investigations and whether or not his future in Kansas City is in question (1:00). 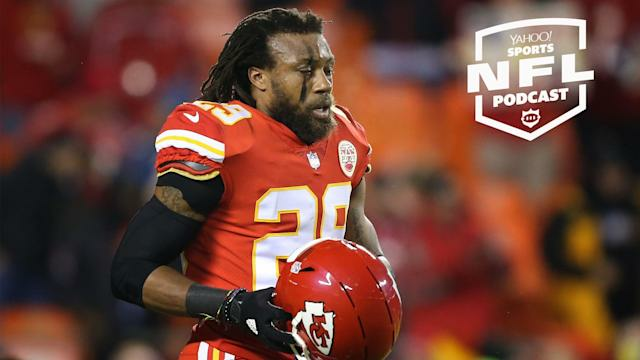 Next, Charles reveals some behind-the-scenes gossip resulting from the Chiefs releasing Eric Berry and the Cowboys being heavily involved in trying to sign the talented safety (6:00). Later, Charles and Terez run through some recent moves including Earl Thomas to the Baltimore Ravens, Randall Cobb to the Dallas Cowboys, DeSean Jackson to the Philadelphia Eagles, Vontaze Burfict to the Oakland Raiders and Blake Bortles to the Los Angeles Rams (17:30). They also speculate on where free agent defensive tackle Ndamukong Suh could sign (25:15). In the second half of the show, Charles runs through some rumors he's hearing about the upcoming NFL draft. He breaks down some quarterbacks Dwayne Haskins, Drew Lock and Will Grier potentially sliding back in the draft (29:55). Charles and Terez close up the show discussing Michigan defenders, Rashan Gary, Devin Bush and Chase Winovich (47:10), as well as cornerback prospects Deandre Baker and Byron Murphy (51:35).